Patcham Place is situated in the heart of Clarens in the Eastern Free State 200m from the main shopping areas and restaurants. All rooms have en-suite bathrooms, carpet and mattress heating, private balconies with beautiful mountain and garden views.Many outdoor activities are available in the area which include hiking, walking, horse riding, fishing, game drives, white water rafting, abseiling, golfing, tennis and quad biking. Double deluxe with kitchenette (Room 4) Sleeps 2 Includes: B & B Twin room, shower and toilet en suite with mountain and garden view, patio and kitchenette. Patcham place is the perfect place for a relaxing, comfortable stay and a short walk across the square to the hustle and bustle. it is immaculate and quiet and the rooms are beautifully decorated. There is so much thought in all the tips, nibbles and treats and the hosts are very welcoming. Breakfast was quaint and delicious. We will definitely be back in the future and would highly recommend it. Had a great time and would highly recommend. 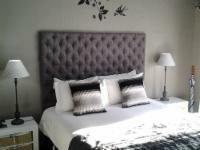 We spent 2 nights at Patcham Place recently and really enjoyed our stay. Very neat and clean. The breakfast was lovely and Richard and Carol are excellent hosts. Will definitely be going back again. Patcham Place is 1.5km from the centre of Clarens , the nearest airport 141.6km (Moshoeshoe I International Airport).